This CD or USB makes a perfect gift - which is not possible with the downloadable digital crafts. Hence the availability now of Anni Arts giftable CDs and USBs to delight a fellow lover of printables. SCANDINAVIAN CHRISTMAS - FOLKSY GOD JUL! ​CD -rom IN DVD CASE, CELLOPHANE WRAPPED. ​The CD has 10 craft sets with more than 64 pages and hundreds of elements. See all page thumbnails on this page. The CD files are in JPG format and in both LETTER and A4 sizes. CD is sent within 1-3 working days. ​USB Flashdrive IN PRESENTATION CASE, CELLOPHANE WRAPPED. The USB has 10 craft sets with more than 64 pages and hundreds of elements. The USB files are in JPG format and in both LETTER and A4 sizes. USB is sent within 1-3 working days. "I am so excited - I love your designs and the colors are so crisp and clear. I cannot wait to get into the Swedish items as that is my heritage and I celebrate it as often as possible. 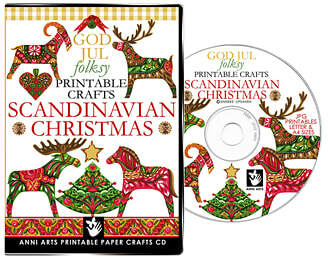 ​Printable Scandinavian Christmas Crafts are beautifully pre-designed for coordinated greetings, favors, decorations, choc wraps, stockings, gift containers, scrap pages, tags, labels for food and cookies, plus wrapping and geo pattern pages for a folk jul. Two exclusive Anni Arts 3D Mugs are included! Folksy Printable Christmas Crafts featuring images inspired by traditional Swedish and Finnish folk-art. For this range, I reinterpreted the painted folk decorations on old objects and toy horses for these Christmas crafts and extended the traditional paint styles to animal figures and a tree that are not usually associated with this folk style – a reindeer, an elk, the Scandinavian Christmas straw goat, plus my own version of a toy horse. • SCRAP SET 8 x 8" IN : PRINT JPG FORMAT and TRANSPARENT PNG FORMATS. 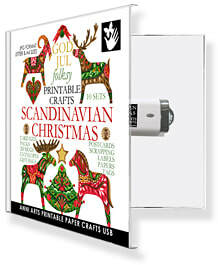 ​The Scandinavian Christmas Cut-N-Make Book has pre-printed Paper Crafts ready to cut, glue and make. No printing required. It features some designs from the printable range, as well as new designs created for the book. The CD has all the extra book designs included. 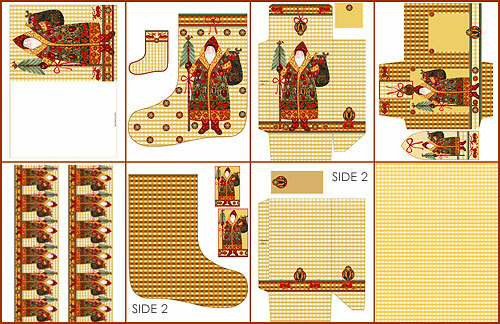 • A stocking front and back for a paper stocking or to iron off onto cloth like unbleached cotton and sewn. Just add a seam when cutting out. Makes a nice scent sachet in both paper or textile versions. • An upright gift packet with flap: 16 cm x 5.5 cm or 6 1/4 inch high x 2 1/4 inch deep. Pay securely with a CREDIT CARD or your PAYPAL ACCOUNT. You do NOT need a Paypal account to buy. This is a physical product that will be shipped to you. Do you like Scandinavian Jul ?Should I add items?